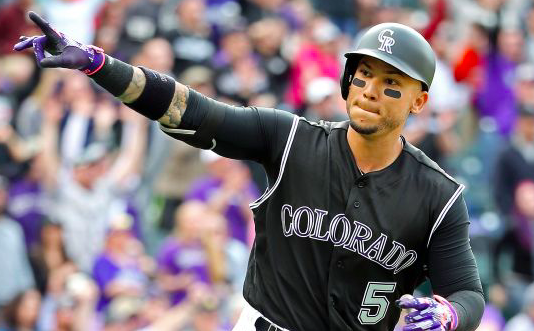 It was nearly three weeks into March before three-time all-star Carlos Gonzalez landed a job this year. Even then, it was only a minor league deal. But less than a month later, CarGo is back in the big leagues. The Cleveland Indians called up Gonzalez from triple-A on Sunday with the hopes that he can provide an immediate boost to a lineup that has struggled early in the season. The 33-year-old Gonzalez has seen his numbers take a hit since the 2015 campaign when he hit 40 home runs. However, he was still a solid contributor for the Colorado Rockies the past few seasons, albeit in a diminished role. Gonzalez hit .276 with an OPS of .796 in over 400 at-bats with the Rockies in 2018. After getting a late start in spring training, Gonzalez reported to triple-A earlier this month. In his six games at triple-A, Gonzalez hit .348 with a double, home run, and three RBIs, helping him post an OPS of 1.008. With an offense that’s sputtering, those six games enough to convince the Indians to bring him to the majors. As mentioned, the Indians have had some problems offensively early in the season. The likes of Francisco Lindor, Jason Kipnis, and Bradley Zimmer have all started the season on the Injured List, which hasn’t helped. Heading into Sunday, the Indians were second-to-last in the American League in runs scored. Things have gone particularly poorly for Cleveland’s outfielders. Leonys Martin and Tyler Naquin have produced a little. But Jake Bauers and Greg Allen are both off to dreadful starts. The same can be said of Jordan Luplow before he was sent to triple-A on Saturday. Needless to say, the Indians are getting a little desperate, making it an easy decision to give a proven veteran like Gonzalez a chance. The only caveat to promoting Gonzalez is now the Cleveland outfield is perhaps too heavy on left-handed hitters. Naquin, Bauers, and Gonzalez all hit from that side. That could make the Indians a little vulnerable against left-handed pitchers, as at least one of them will be in the lineup. Of course, the entire Cleveland lineup has looked vulnerable early in the year, barely averaging three runs per game. Ultimately, how much Gonzalez will play will depend on his performance. However, he figures to get a bulk of the playing time in left field in the short-term. The Indians wouldn’t have brought him up if they hadn’t seen enough of Allen and Bauers for the time being. Gonzalez should get a fair opportunity to show that he can still produce in the majors as an everyday player. Despite being one of the worst offensive teams in baseball, the Indians started play Sunday with a winning record. But until they sort out their offensive woes, they won’t be able to seize control of the AL Central, as many expect them to do. At this point in his career, Gonzalez is far from an impact player. However, the Indians are hopeful that adding a veteran to their lineup can help provide the offensive spark they need right now.